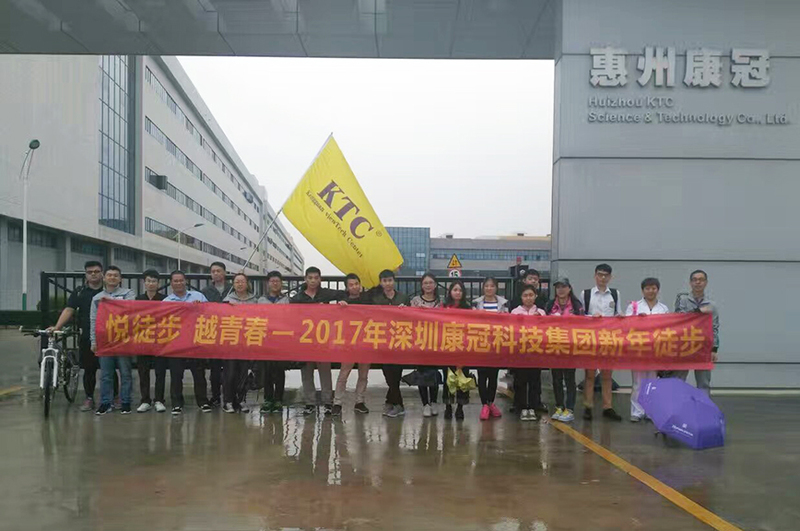 In order to enrich staff life,strengthen group cohesiveness and embrace 2017, KTC Group carried out “Cheerful hiking,youthful life-2107 Shenzhen KTC Technology Group New Year Hiking”activity from December 24 to 25. Staff from Bantian factory and Huinan factory actively participate in this activity. At the morning of 24,Huinan hiking activity was held as schedule. The whole journey is 17km. Hiking team marched on rural road in all weather,along with laughter. At the morning of 25,Bantian hiking team gathered on the KTC gate and marched toward 5km urban road and 12km Silver Lake Mountain Park green way,where surround the green water and mountains. Breathing fresh air and enjoying hiking fun,team members help and encourage each other to complete long-distanced hiking,which is a hard test for them. They firmly believed that the destination is on ahead and the success belongs to the persevering. Finally,all members arrived the destination after 4-hours hiking. This hiking activity fully displayed KTC spirit of tough and fearless and enriched staff spare-time culture life. Embracing nature and enjoying healthy life,participants said that hiking is a very meaningful activity,which not only cheer mood,but also experience collective fitness fun. Cheerful hiking,youthful life. Let’s say goodbye to 2106 and embrace 2017 in youth posture. Work happily and live healthily.